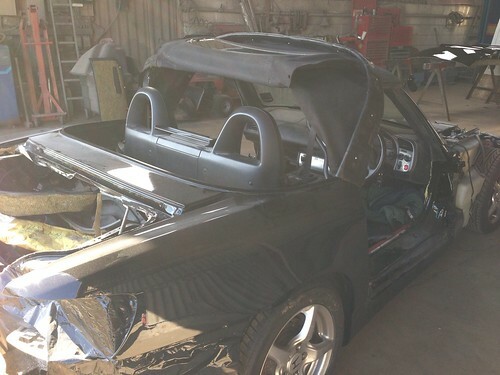 Ok, so I’m going to attempt to document below how to remove the soft top for those of you who have always wondered how much of a job it is and for those who want to tackle it themselves to save some money. I only cover removal that includes the entire frame and not removing the actual top from the frame itself. The reason for this is I have swapped the good condition one off my written off S onto my new S with a pretty tired roof. I also only base this guide on doing it with the roof UP as I have the battery disconnected. Also, this is a guide purely for help to others and I cannot be held responsible for any mistakes made by anyone as a result of using this guide. This isn’t a task for the novice as you’ll clearly see as the guide goes along so take plenty of breaks to stretch your back, make sure you have tea or coffee to hand and if you get hacked off with something again take a break and come back to it or get someone else to help you! I’m sure there are other ways that people have to do this and this just documents how I have done it. Feel free to add comment if you wish to share a work around or a faster method to anything I include. Ratchets – 3/8 and a ¼ inch drive are advisable. Plastic cups, masking tape and a pen if you want to keep track of where things have come from! Philips head screwdriver, small and medium one or better still a socket based one as the small socket head with the Philips in it will come in handy as you'll see. An extra person to make life easier or simply to help lift the roof and frame out when the time comes. Firstly remove the plastic sills with the ‘S2000’ logo on. 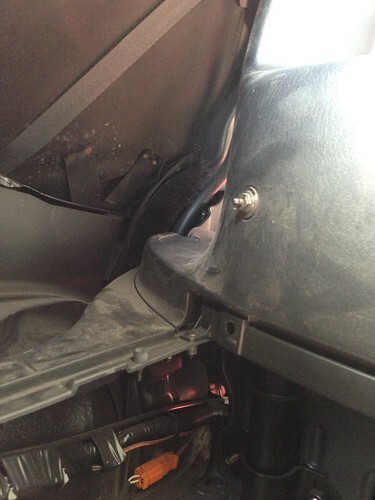 To do this open the door, get your fingers underneath the sill on the inside of the footwell and pull upwards. They are secured using plastic clips so will pull out no problem. They are quite tough and sometimes require a little bit of persuasion but don’t pull too hard or you risk breaking them. Next you should remove the seats for easy access. Slide the seat all the way back and then use a 12mm socket and extension on the 1/4in drive to remove the bolts from the floor. I don’t have any connections under my seat so can’t comment on that for later MY cars. Now slide the seat as far forward as it will go and pull the lever to tilt it so you can reach behind. Now use a 14mm socket on your ¼ inch ratchet with extension. The seat should now be free. 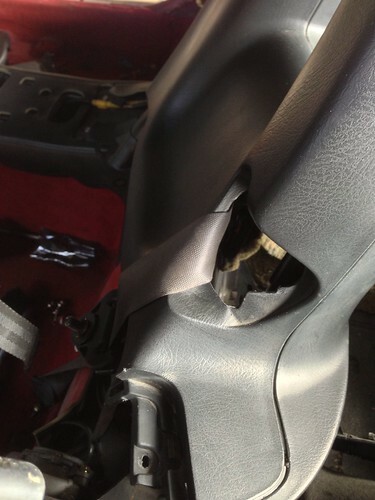 Don’t forget to unhook the seatbelt from the shoulder loop on the seat and then rotate it out of the car base first. If you struggle with clearance either put the roof down or just tilt the back as far back as you can so it clears the roof easily. 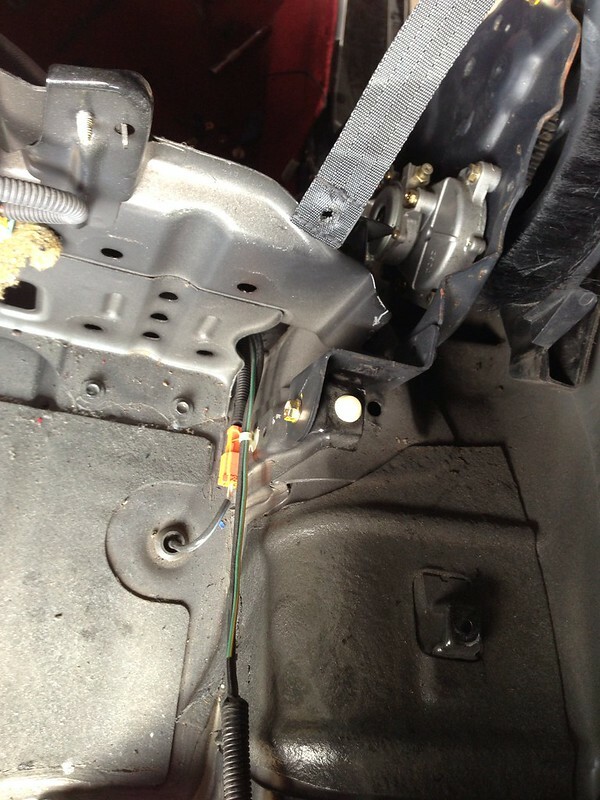 Once this is done, unbolt the seatbelt from the floor using an extension and a 14mm socket on the 1/4in drive. 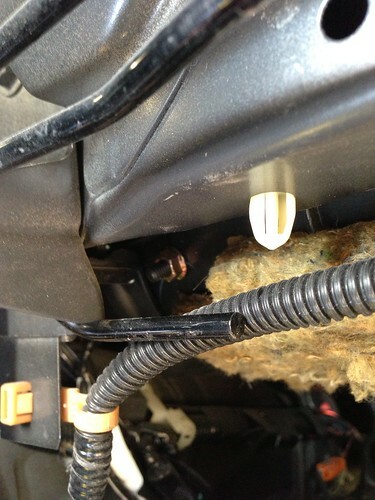 There may be a rubber blanking cover over the bolt which should just pull out with your fingers. 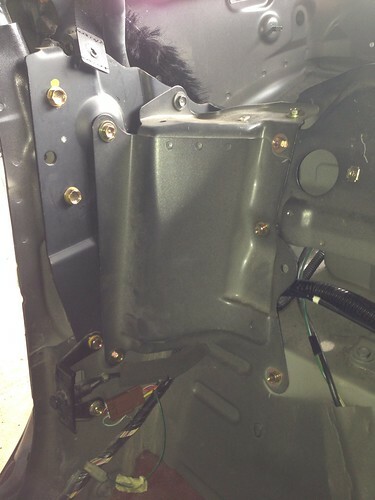 Also use a Philips head screwdriver to remove the small screw from the bottom of the plastic side panel that goes from the floor area of the door shut all the way up to the roof (driver side piece has the fuel pull lever on it for reference). Once these are removed you can then pull the vented panel towards you by getting your fingers underneath it. Be a little more gentle here as they are fixed into place with 4 metal popper clips in each of the 4 corners and you can sometimes either break these or occasionally break the clip aperture they sit in. You will now be able to see the bottom of the roll hoops nice and clearly. Now undo the 3 screws you see in the picture below using a Philips head screwdriver. If they are tough to undo then use a screwdriver you can attach a 3/8in ratchet to the end of so you can apply a little more pressure to bring it out. View further away to know where you are looking! Now remove the centre console down the drivetrain tunnel. 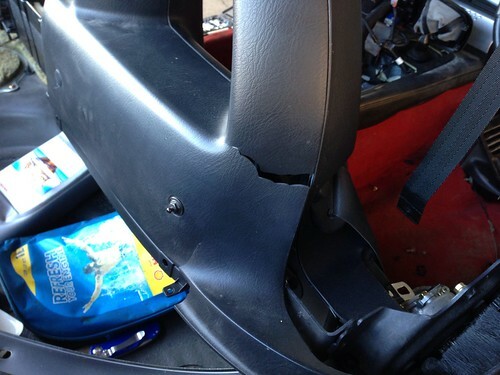 To do this you firstly need to remove the gearknob. 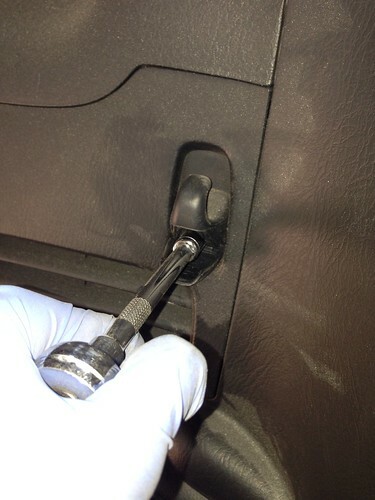 Use an adjustable spanner turning the spanner clockwise on the nut as you turn the gear knob anticlockwise. Then just unscrew the gear knob and the nut (I place them in the cup holder and shut the lid to keep them safe). 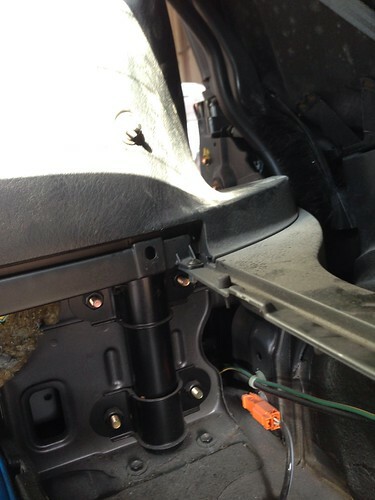 It will now reveal a pair of screws underneath the 12v socket under the glove box. You need to remove these screws in the same way you did with the ones under the roll hoops. Now go into the boot and remove the spare wheel and the carpet to the left of the spare wheels that hides the fuel tank and filler neck. 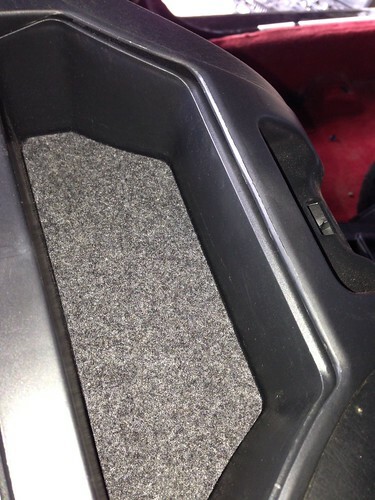 It is also beneficial to remove the side carpets that travel around the rear ¼ panels and to the back of the rear lights. This can be done using a trim tool to gently prize the clips out. Once this is all done it’s now time to turn contortionist as you need to remove the rear tray and side plastics behind the roll hoops. 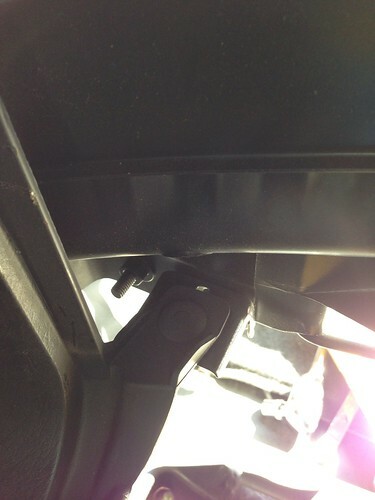 To remove the wind deflector remove the small grommets on top of the deflector bracket, behind the deflector and it will reveal two screws. 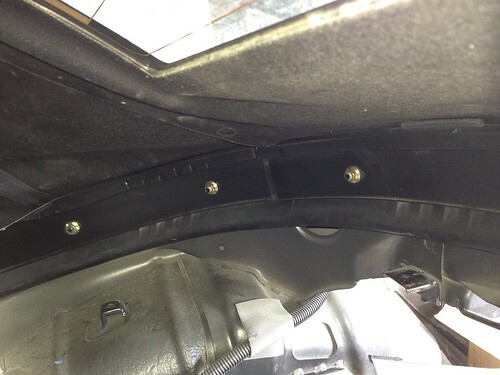 Take the screws out and the deflector comes off easily. 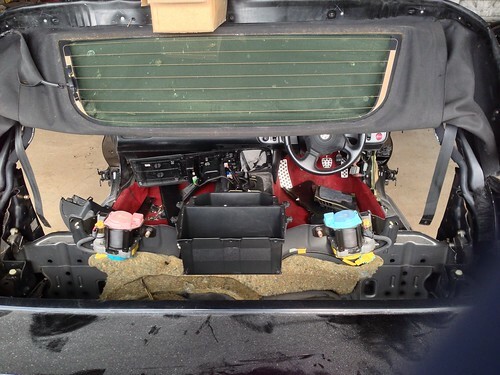 To remove the rear plastic panel just pull the top part closest to the glass towards you and upwards and it should come out without any problems. Now stretch your back by getting out and going back around to the boot. 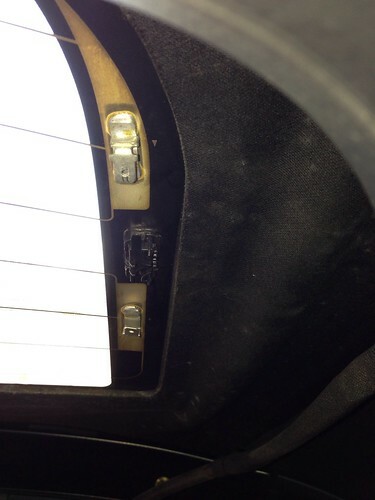 Looking in the boot where you removed the carpet that hides the spare wheel and fuel pump you’ll see Some white plastic clips like this one in the image below. Also look carefully to the left and you’ll see an 8mm gold nut. 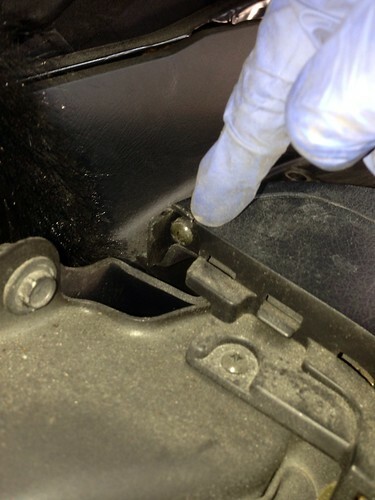 Remove this nut as it is attached to a bung on the inside of the car to secure the flat parcel shelf in place so it doesn’t collapse when the roof is down. 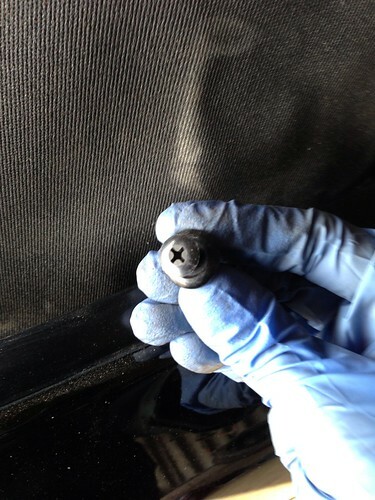 Remove the nut (there are 2 in total, one on each side of the car). Now go back to those off white plastic clips. There are 4 across the back of the parcel shelf (3 of which you can see pictured below, the far left one is hidden by the electrical cable). To save breaking these use your long nosed pliers to squeeze the clip together as you push upwards with your hand on the felted area which is actually the underneath of your internal parcel shelf. 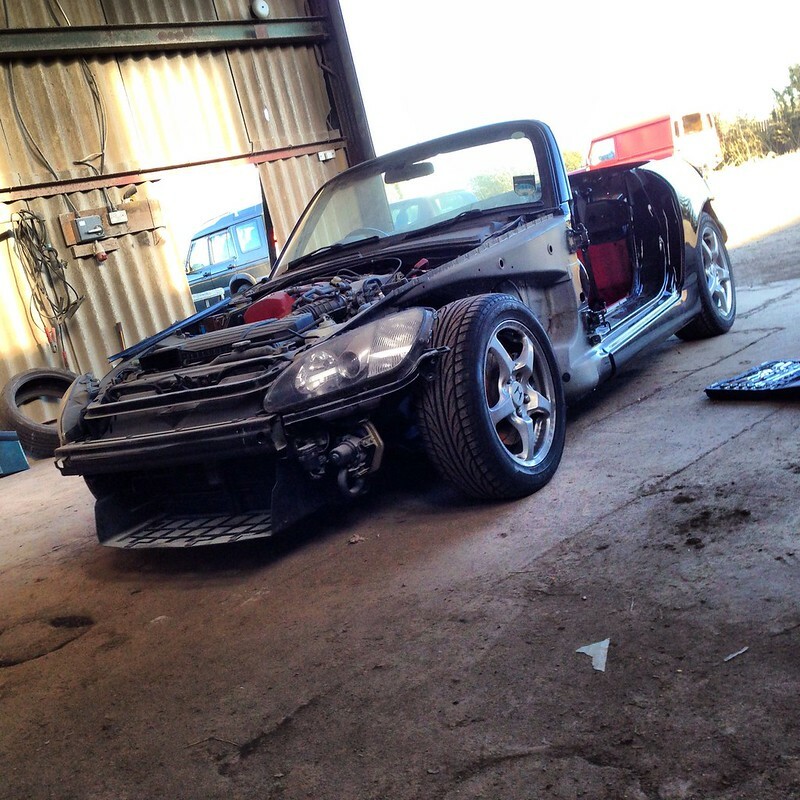 Once done, get back into the car, straddling the drivetrain tunnel and look between the roll hoops; get your fingers under the parcel shelf on either side and prize upwards. 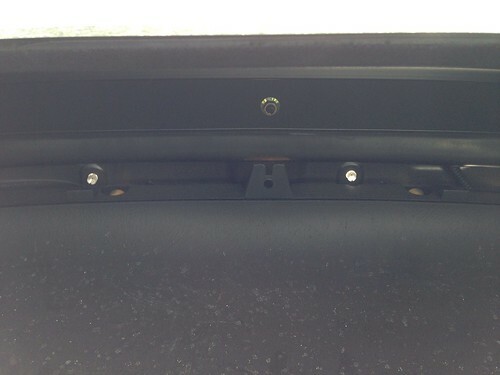 The parcel shelf should then pop up off those white clips you loosened off. 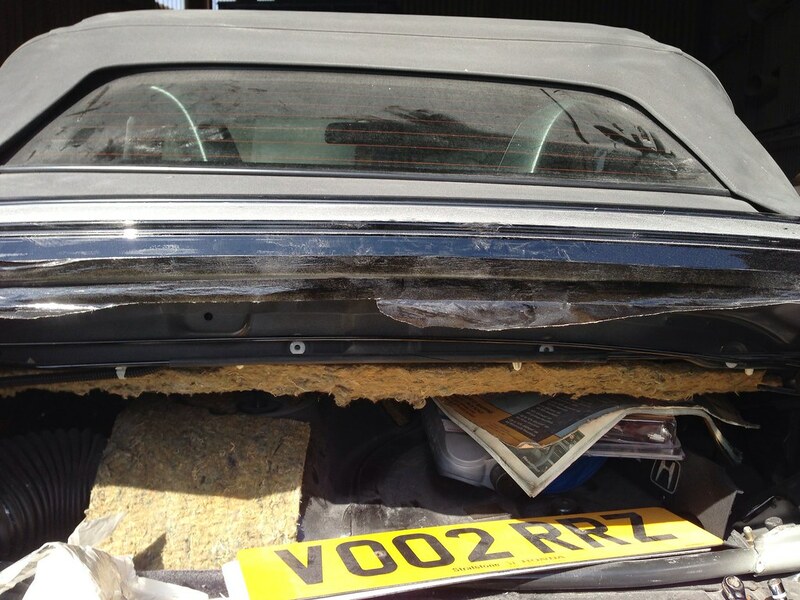 Now remove it through the open boot rather than trying to squeeze it between the roof and the roll hoops! You now need to tackle the side panels that sit behind and to the left and right of the roll hoops. 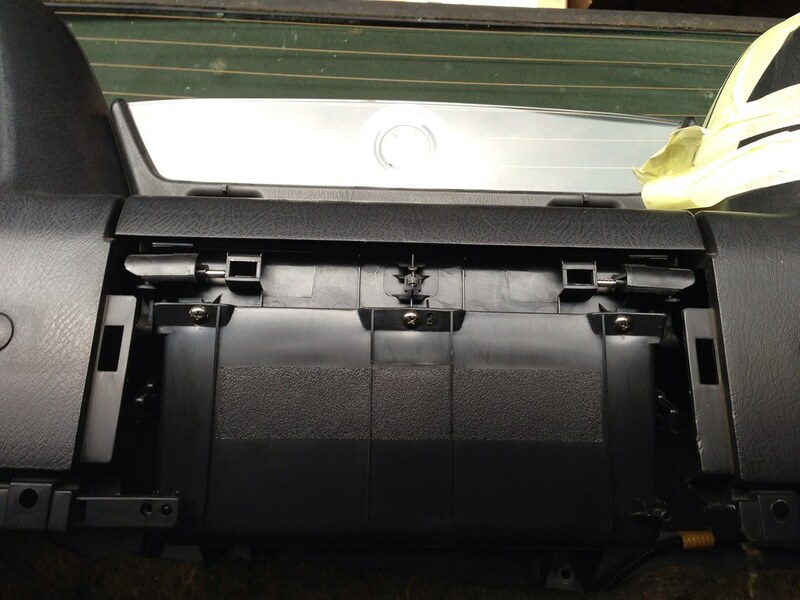 Now that you have removed the centre of the parcel shelf you will see the back part of the side plastics are held in place with another black grommet/popper. This can be unclipped or more than likely it will just break! 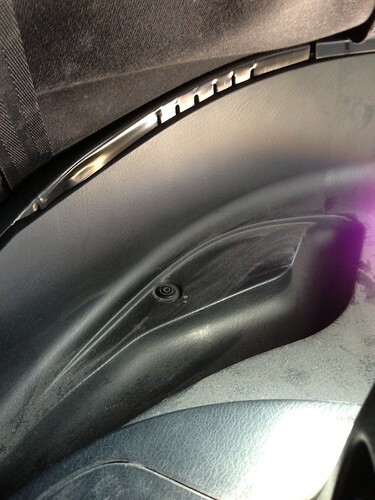 After those 3 fixing points are removed you should now have some fairly free movement of the rear side plastics. They do sit under the ends of the roll hoops on the outer sides so they are a bit fiddly to remove but I don’t know of any easy way to remove them as I just wobbled them until they came loose! 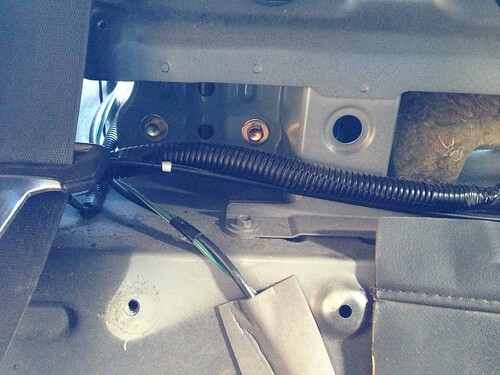 On the passenger side, remember to remove the bung from the cable going to the heated rear screen if you have one as well as unclip the two spade connections from the screen itself. The two space connectors are secured flatly to a funky little clip that needs opening with a small trim tool or small flat head screwdriver. Now that all the rear plastics have been removed from behind the roll hoops you should now be able to see the metal roof support brackets, which are broken down into 3 separate pieces. Remove all the gold nuts (think they were 10mm) with an extension on a 3/8in ratchet as they are pretty slack. First remove them from the centre section and then just pull the bracket towards you so it slides off the screw threads. 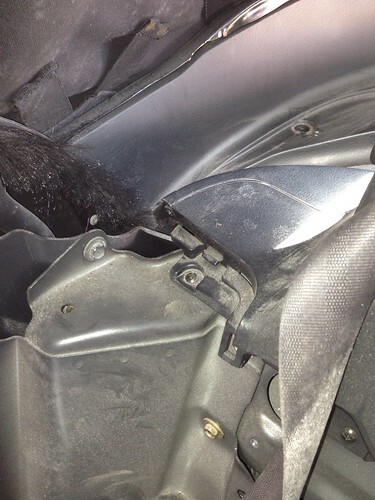 Again remove this metal bracket through the boot rather than over the roll hoops or you risk scratching something. Now remove the nuts from the side sections. There is one nut on each side that is partially blocked by the roof brush and drainage ducts. To work around this use a universal joint on the end of your socket extension. Be careful not to drop the nuts though (I have one stuck in my drain hole from when I was putting it all back together). 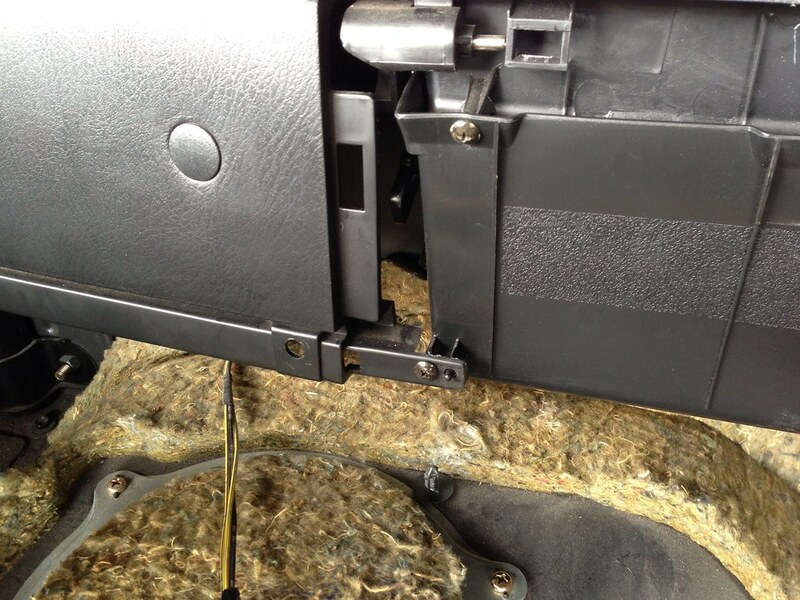 After all the metal brackets are removed you should now be able to pull the rear of the soft top off the screw threads underneath the rear screen. If you have trouble doing this unclip the front catches to slacken the roof off a little bit. 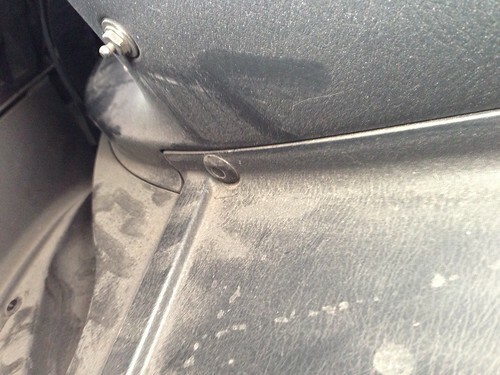 You will only be able to remove the roof from the screw threads around to the last 2 on each side where the rear roof straps attach (pictured below). As a note, when you put it all back together make sure you put the rear roof straps in place before putting the metal brackets back in place AND watch you don’t get the HRW cable caught behind it either. If you do it all has to come out again. Also when you put it back in, put the central bracket under the rear screen in place first as you can seat the outer two easer this way around. If you put these brackets in upside down your glass screen will hit the roll hoops and if you don’t put the straps onto the second locator threads your glass screen will hit the roll hoops. Now that this is done you should be able to fold the rear of the roof forward and rest the glass screen on top of the roof frame. You might need to put something on top of it though to stop it from falling as the plastic roof gutter of the roof might scratch your rear ¼’s as it falls. Now that you have the back of the roof off you can work on the back of the roll hoops easier. At the back of the roll hoops there is a central panel. Pull this towards you off the clips (unless there are two screws at the bottom left and right corner of it, if so then remove first). That will reveal the back of the ‘secret compartment’ box. 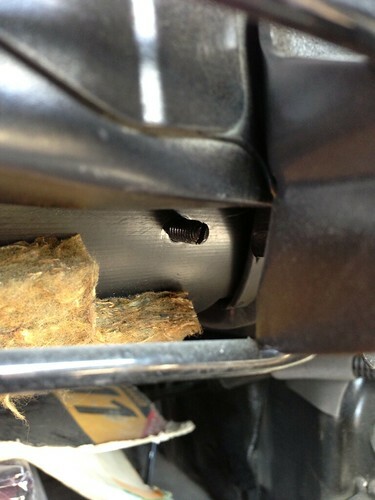 Remove the three screws that go into the compartment box directly underneath the lip where your wind deflector sits. 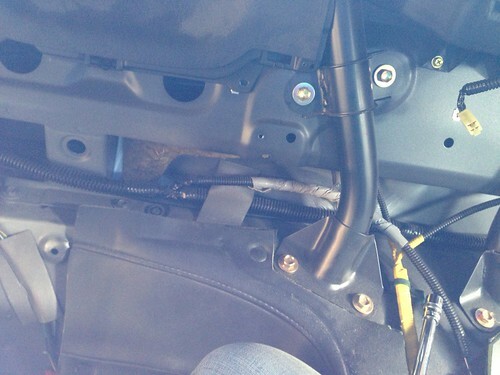 Now get back in the car and remove the 4x screws on the top of the secret compartment. 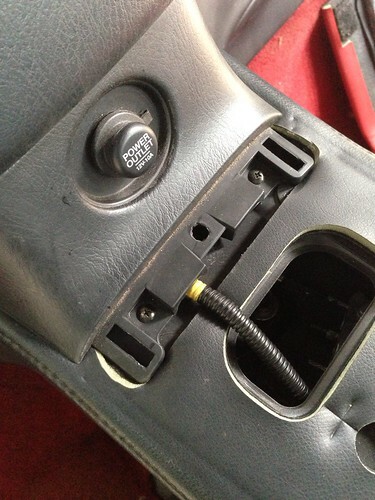 Once these are removed you will now need to gently pull the centre console out from between the roll hoops. 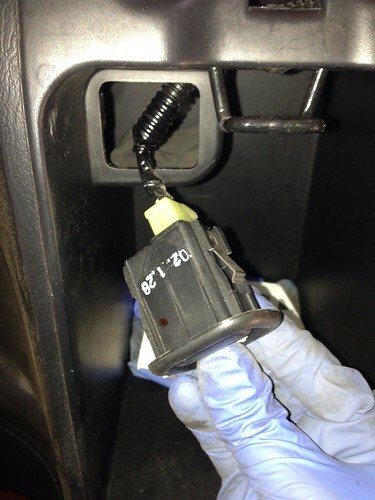 Before you do this though, put your hand behind the centre console and push the boot release switch through into the glove box and then disconnect it from the multi-plug. 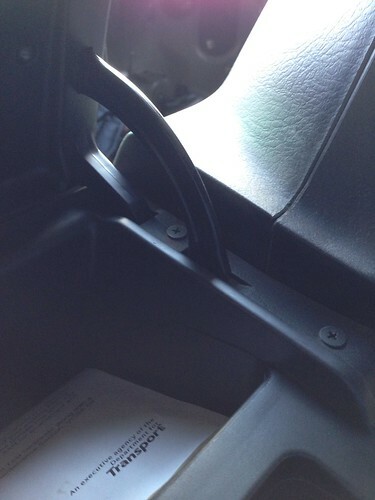 You can then start to pull the centre console and glove box area outwards towards you and upwards. 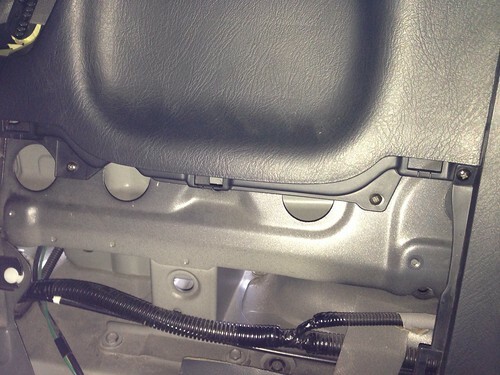 It will make a ‘cracking’ type of noise as the metal clips release from the secret compartment storage unit. 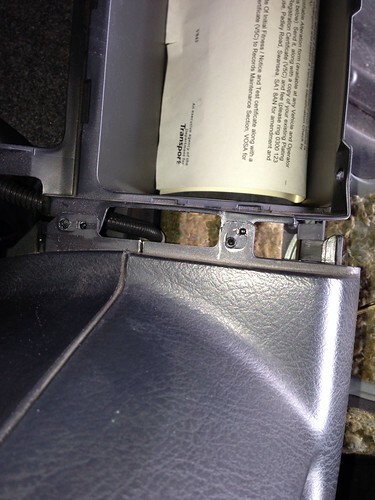 The bit below DOES and is supposed to separate from the outer glove box, centre console and secret compartment lid (You will see what remains in a later picture once the roll hoops are removed). Again remove this from the rear of the car as it is easier to lift up and over rather than between the roll hoops. By this point you should only have the roll hoops left from the rear section of your interior. You should now undo the top section of the seatbelt from the roll hoops. 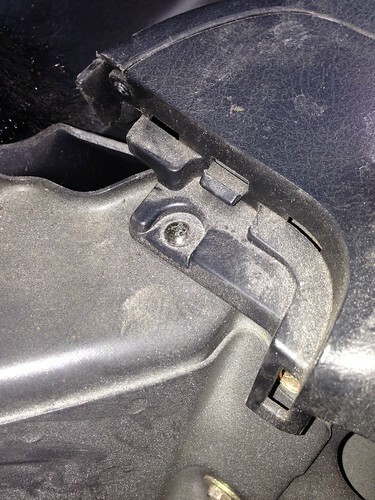 To do this, remove the rubber bolt cover from the belt clip in the roll hoop and use your 1/4in ratchet and use a 14mm socket to undo the seatbelt. Also, as a tip – don’t forget to re-thread the seatbelt through when you put the hoops back in place or you’ll have to undo them again and start over! Now you can tackle removing the roll hoops. THE PLASTIC SHOULD NOT BE SPLIT FROM AROUND THE ROLL HOOPS! If you try to split them you might end up doing this! As well as the two pictured below AND two directly above them in the bulkhead (missed them off the picture – sorry!). The roll hoops will now lift straight out but you will have to carefully manoeuvre the seatbelt buckle etc through the plastic to remove them completely. Also, as a note for when you’re putting them back in, make sure they are situated on the locator pins of the secret compartment box (pictured below) as this will ensure all your plastics align correctly as it goes back together. 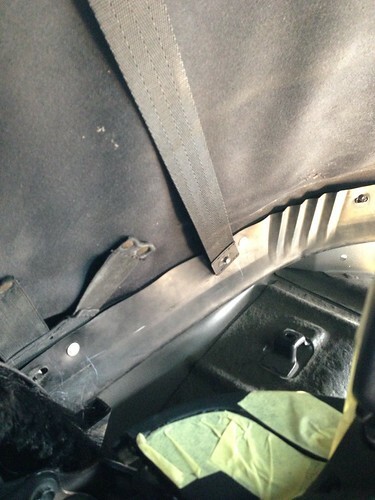 As you can see from the picture you leave the seatbelts in place as well as the secret compartment box. Back in the car once again you now need to remove the roof support plate (pictured below) by removing all 5x of the gold bolts. From memory these are either 10mm or 12mm and can be done with whatever ratchet you have handy. You also need to remove the smaller, body coloured one at the top of the plate too. Once the roof support plate is out you can then see the motors and the roof frame itself. You now need to undo the 3 gold bolts marked with yellow paint from the vertical area next to the door shut (the central one has already been removed in my picture) as well as the one that is situated just behind the roof motor (look just above the tape to the right in my image below). To get to the one behind the roof motor use a universal joint. Again I think these bolts are 12mm and you’re best to use your 1/4in ratchet and extension as these need to be fitted quite securely. 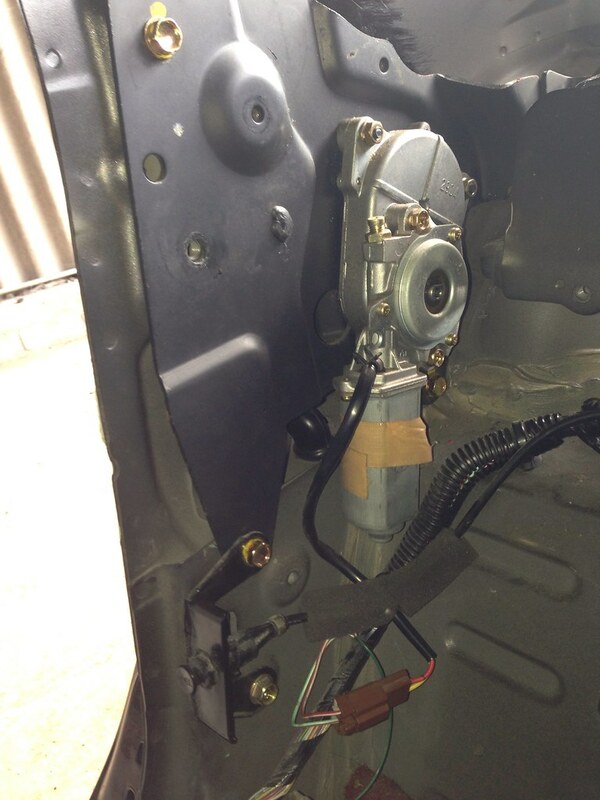 The drivers side is pictured as it shows the fuel filler pull switch. Only undo the top one so you leave the bottom of the pull switch bracket in place. 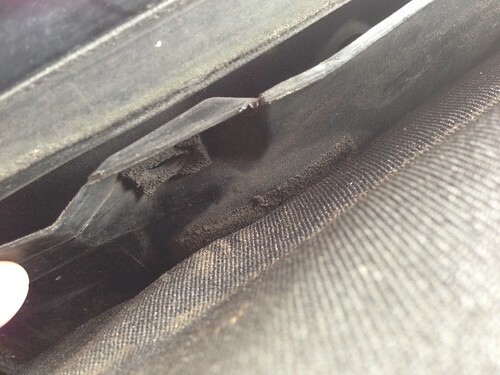 Get back out of the car and now look where the back of the roof frame is secured as there is one final, gold bolt to remove on each side (pictured centre of image below). You can’t see this bolt until you remove the roll hoops and this section of the roof frame prevents the roof from being lifted out without removing the roll hoops. Trying to leave the roll hoops in place is how I broke mine! 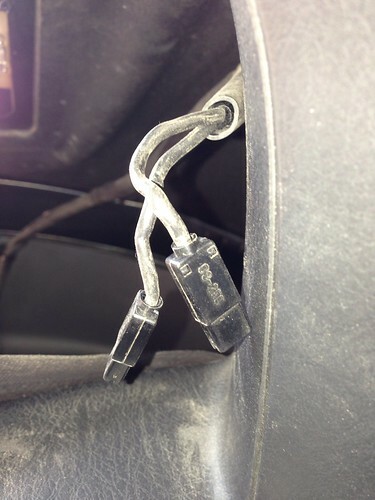 Now disconnect the brown multi plug for each roof motor and with a person on either side lift the roof directly up and either remove taking it over the windscreen or the boot (shut the boot and then take it that way is probably best otherwise your doors also get in the way). 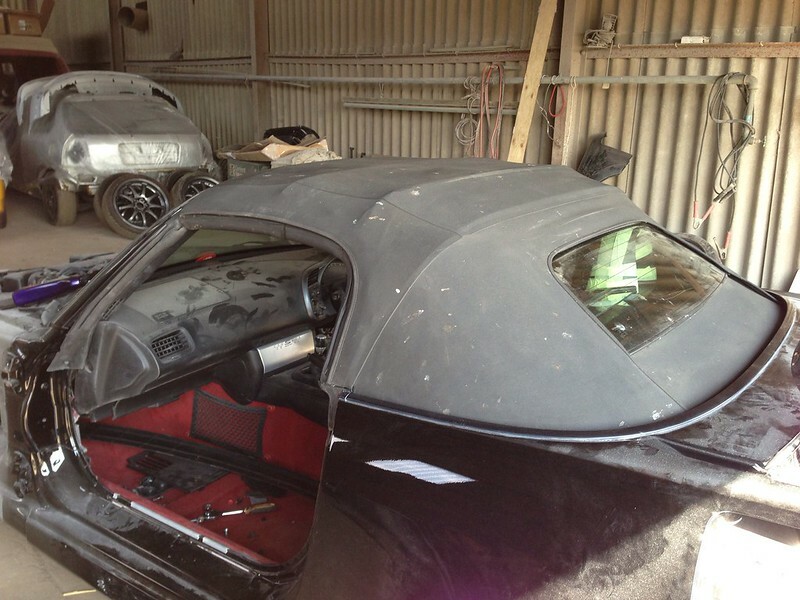 Voila – your roof is now removed…along with most of your interior! Oh, I don’t have doors either as they had just been painted! Once it’s all back in, stand back and admire your awesomeness! Great!! I am going to replace my soft top soon, so your topic will be of great help. 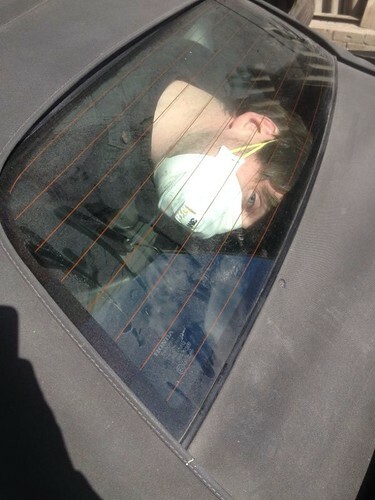 Makes you think that Jack Smith isn't right in the head doing new roof + fitting for that cheap! Love a good detailed "HOW TO"
Can honestly say I hope I never need to tackle this job though! I considered doing this myself, until I saw a guide somewhere. 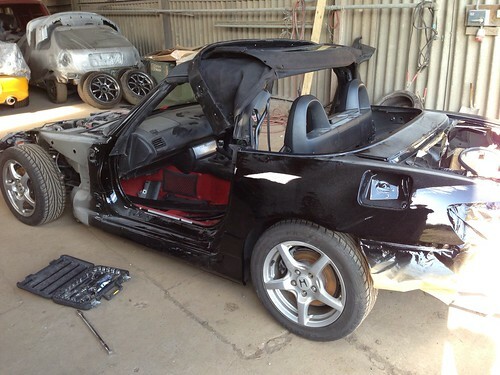 Hands up who thought removing the soft top would just be a couple of bolts under a plastic panel?